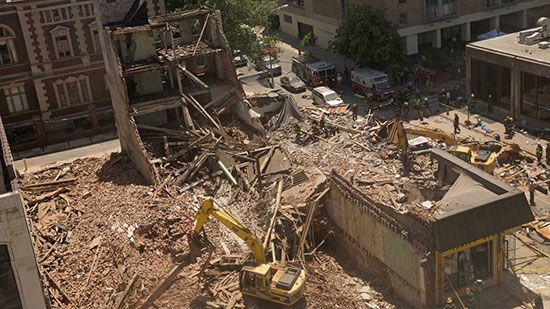 A settlement has been reached in the deadly 2013 Center City building collapse that killed 6 and injured 13 at the Salvation Army thrift store at 22nd and Market. The settlement is worth $227 million and will be paid out to 19 plaintiffs including the families of those who died. The settlement agreement was reached on Wednesday while the jury in the case was still out deliberating the damages. On January 31st, the same jury found that all five defendants shared a portion of the blame and should pay damages. They include the Salvation Army, building owner Richard Basciano, Philadelphia architect Plato Marinakos, Jr, contractor Griffin Campbell, and excavator operator Sean Benschop. The jury placed most of the liability on the Salvation Army. The SA said in a statement, "Our deepest sympathy remains with the victims and their families through this extremely difficult time. We pray for the healing of our community." There is no word on how the $227 million will be paid between the defendants or distributed amongst the plaintiffs. A Montgomery County high school hockey player died after collapsing following a game at the Wissahickon Skating Club in Chestnut Hill on Sunday. Nick Bond, the senior captain of the Springfield (Montgomery County) High School team, had just scored a goal when he came off the ice complaining of a headache. He told his coach, who is also his father, of the headache and then he collapsed. He was taken to Albert Einstein Medical Center, where he was operated on to relieve pressure on his brain. Bond died on Monday afternoon. No had seen him take a hit to the head during the game but the Philadelphia Medical Examiner said he died from blunt force trauma. His death has been ruled accidental. Bond also played football and lacrosse for the school as well as local club baseball. Good Samaritans helped save a man's life in Bethlehem, PA on Tuesday afternoon. It happened right outside the Sands Casino. A man collapsed after suffering a heart attack while walking across the street. A construction worker and a nurse at the scene immediately began performing CPR on the man until authorities arrived. Police officers took over and continued CPR and used a defibrillator. Paramedics took the man to the hospital. He is expected to survive. This afternoon, Partly cloudy, temperatures in the low 60's. 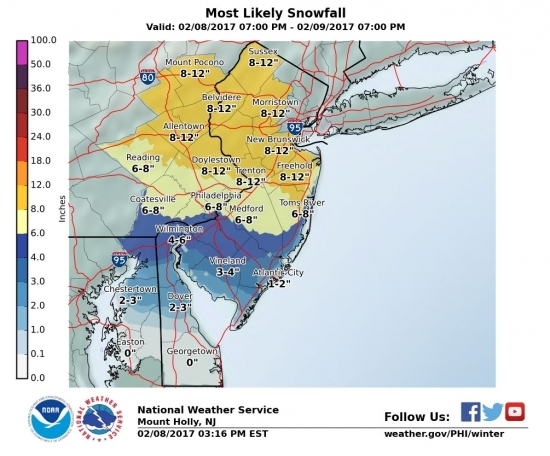 Tonight, Winter Storm Warning, 4-8 inches of snow by midday Thursday in Center City. See snow total map below.